World Mental Health Day is an opportunity to raise mental health awareness by promoting the powerful work that libraries do to improve the wellbeing of local people. We’re marking the day with the release of the 2016/17 evaluation of Reading Well, celebrating the impact of the scheme and the wider Universal Health offer on community health and wellbeing. Our evaluators spoke to a range of stakeholders to assess Reading Well’s impact, including health professionals, library staff and users of the scheme. 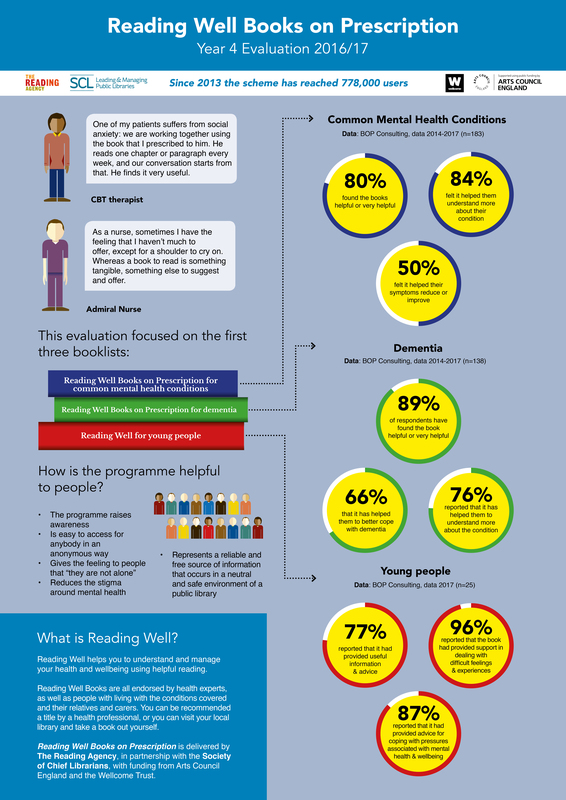 The scheme has reached approximately 778,000 users since its launch, and Reading Well has had a hugely positive response from them: 90% found the common mental health conditions booklist helpful or very helpful and 96% said the same of the dementia and young people’s booklists. This was the first time the impact of Reading Well for young people has been evaluated and the clear message is that the young people had found the books they had read helpful in understanding their mental health and wellbeing and dealing with difficult feelings and experiences. Reading Well remains a key driver of the Society of Chief Librarian’s (SCL) Health Offer, with 98% of English library authorities now participating in one or more of the Reading Well schemes. Library staff described the strengths of Reading Well for young people in particular as raising mental health awareness, reducing stigma and providing reliable information that can be accessed easily and anonymously. The neutral and safe environment of the library was highlighted as strength of the scheme, as well as the fact that it was free to use.